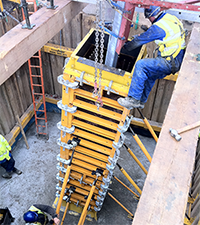 ORMA is a heavy-duty modular formwork system. Ideal for construction and civil works projects (walls, columns, abutments and footings). Lift up to 60m2 of assembled formwork at any one time. Lighter weight accessories. Stronger panels mean fewer components, saving assembly time. Keeps makeups and boxouts to a minimum, ensuring maximum efficiency on your site. Savings on site with only 2 ties in a 3.3m height. The new features offered by the Spanish system, allow permissible concrete pressures of 80KN/Metre squared using a 15 millimetre tie rod, this is opposed to 60KN with any other widely available system in the UK. This system offers customers some significant savings on site. It is a modular formwork system for use on large areas and for repetitive pours of concrete. The system combines some of the main advantages of the current systems in the UK, such as the lightweight clamping system and the combined nut and washers (which are now the norm for any credible system). Also fast forming stop end solutions and clip on access brackets. Robust panel with steel frame and reinforced corners. Safety items for easy application to panels. 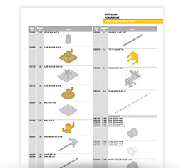 For more detailed information read the Orma product guide.